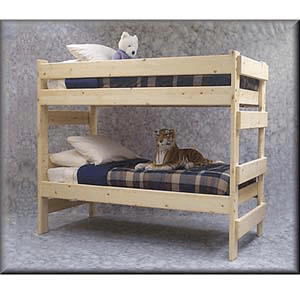 Make The Best Use Of Your Limited Space With This Bunk-Bed In Unfinished Premium Douglas Fir. Make The Best Use Of Your Limited Space With This Bunk-Bed In Unfinished Solid Wood Premium Douglas Fir.. All Rails And Ladder Rungs are made of 2 ft. x 6 ft solid Premium Douglas Fir. Craft a look that both you and your little ones are sure to adore when you decorate with Heartland Triple Bunk Bed. Solid Pine Wood Bunk Bed as shown. Easy to assemble. This one piece Bunk Bed is make of Solid pine wood.